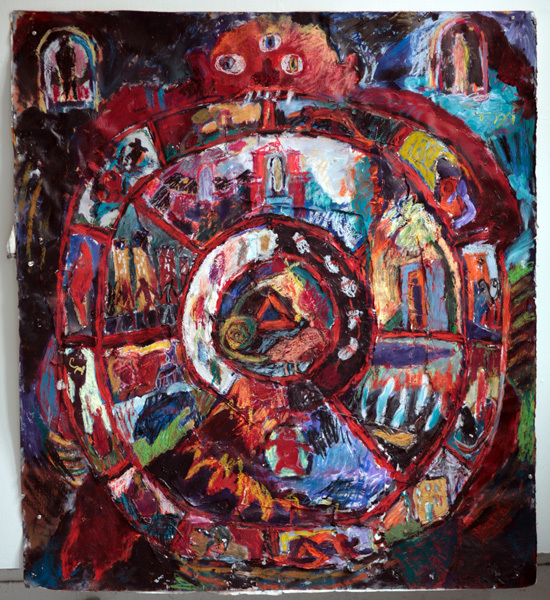 In March, I attended a workshop on the Tibetan Wheel of Life. 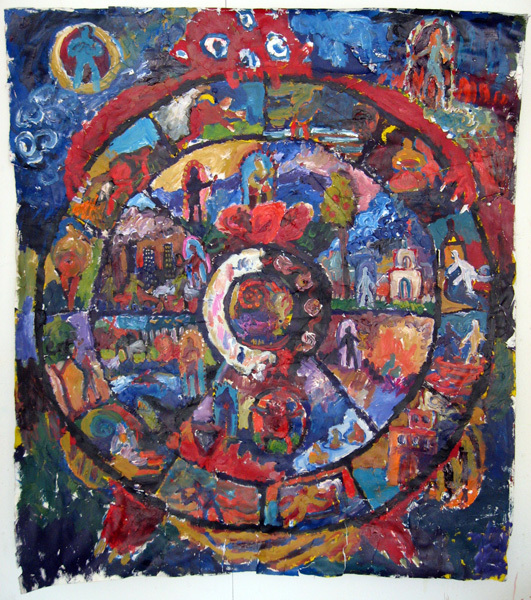 The Tibetan Wheel of Life* (samsara) is the chain of successive rebirths and deaths that comprise our existence. It is the dream that we create and are subject to, unless we attain the awareness that leads to liberation. 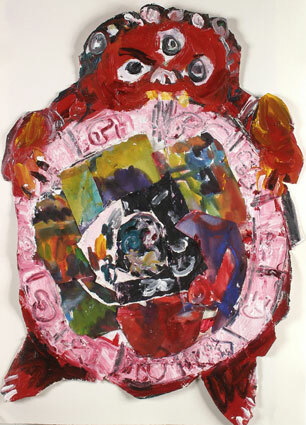 The following works of art are interpretations of the Wheel, made with acrylic paint and mixed media collage on paper. The innermost circle of the Wheel contains a pig, a rooster and a snake, representing respectively, the greed, ignorance and jealousy that keeps us trapped on the wheel. The next circle shows the two paths one can take: the light path to enlightenment or the dark path to further suffering. 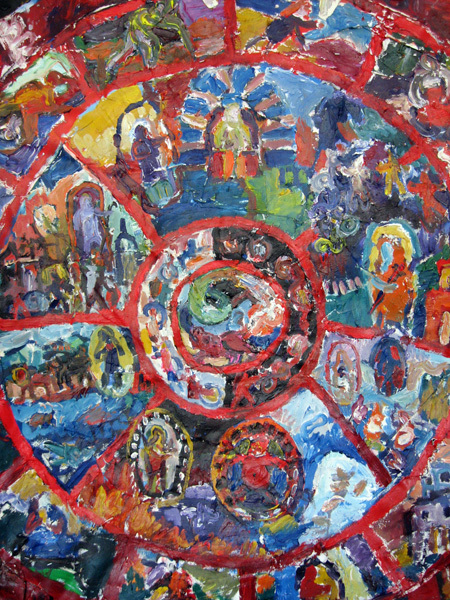 The six sections of the next circle depict the six realms of existence which are subject to birth and death. Clockwise from top: the god realm (paradise until your time is up! 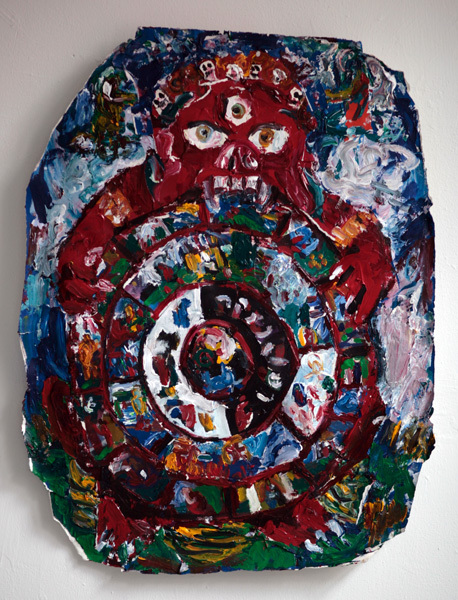 ), the demigods (who fight with the gods), the hungry ghosts (always hungry but mouths are size of pins), the hell realm (again, not permanent), the animal realm (not very fun), the human realm (suffering and little joy). The outermost circle shows the twelve causes or attachments that link us to the wheel. They include ignorance, emotions, desire, grasping and death. 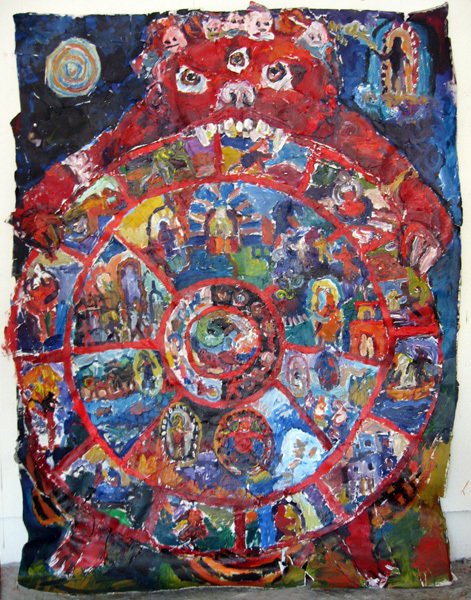 Here you can see the inner circle with the pig (greed), snake (jealousy) and rooster (ignorance), the next circle showing the two paths (light and dark), surrounded by the six realms of existence (gods, demigods, hungry ghosts, hell, animals and humans). Each realm contains a Buddha who holds the key to escaping that particular realm. Recall that even the god and hell realms are impermanent.